BrainMaps.org is an interactive multiresolution next-generation brain atlas that is based on over 20 million megapixels of sub-micron resolution, annotated, scanned images of serial sections of both primate and non-primate brains and that is integrated with a high-speed database for querying and retrieving data about brain structure and function over the internet. Currently featured are complete brain atlas datasets for various species, including Macaca mulatta, Chlorocebus aethiops, Felis catus, Mus musculus, Rattus norvegicus, and Tyto alba. Now that we can travel through our brain, maybe we can start searching for the mind and soul, individually. Yes I am joking. Anyway. Brain maps does not only provide a map of the human brain but it also makes it possible to travel among other primate and non-primate brains. Back in 1999 when there was only a poor dial-up connection in Turkey and no real internet service providers, we were talking about a future where doctors could operate surgeries through the internet. This application reminded me our conversation then. I think brain surgery or any other surgical treatment is not yet available online. 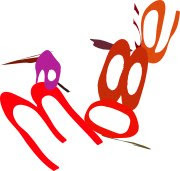 Brainmaps also offers several software. I tried StackVis among them and it worked well in spite of the fact I executed it under linux through wine. 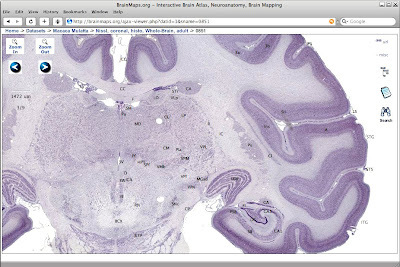 Other brain software available at Brainmaps are Nodes 3D, Brain Analysis and Isosurf Volume. I haven't tried them but they look interesting.